Test now extremely cheap - without obligation to subscribe: 3 issues Manager Magazin for only 17,90 EUR with 34% savings free delivery, incl. 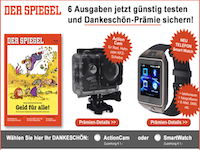 Valuable FREE thank-you to choose: SmartWatch CALL or 15 EUR Amazon voucher. Test without subscription obligation with FREE test gift. Choose your gift: SmartWatch CALL. OR: Wide Angle VideoCamera / DashCam for helmet, handlebar or car dashboard to ride records eg for evidence.